Stacy was a newlywed when she became a financial advisor 10 years ago. It was her husband Rick’s second marriage and she found herself a stepmother to a teenage boy. 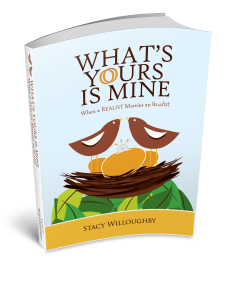 Over the years, as she and her family experienced the joys and challenges of blending their lives and finances, Stacy found that her stories mirrored those of other couples in her financial practice, inspiring her to write, What’s Yours is Mine–When a Realist Marries an Idealist. A lighthearted yet intimate look at the financial struggles couples face, What’s Yours Is Mine – When a Realist Marries an Idealist offers personal insights based on Stacy’s own marriage and her expert advice from years of experience helping couples overcome their fear of talking about money as they work together to achieve their dreams. What’s Yours Is Mine offers practical guidance about how to find positive ways to communicate about money to inspire couples to reach for their dreams together.